Horror films as smart as “Orphan” don’t come along every day. As a matter of fact, they probably come along once every few years. When dialog is paid close attention to and realism is guarded more heavily than the Declaration of Independence, you usually have enough substance for a suspenseful thriller, but it isn’t until the blood and gore come in that you have the ingredients of an original and engaging horror/slasher flick. Luckily, this film has both. However, when you add in an insane twist at the end that rivals anything in the best M. Night Shyamalan films, you have a once in a lifetime horror flick that manages to shock you as much as it entertains you. Make no mistakes about it, “Orphan” is the sleeper hit of the summer. The acting in most horror/slashers is predictable and campy, but “Orphan” is unpredictable. Peter Sarsgaard [Shattered Glass, Garden State] and Vera Farmiga [The Departed, The Manchurian Candidate] play John and Kate [No “Plus Eight” here] Coleman, a couple looking to adopt a third child after Kate has a miscarriage. Their dialog throughout is warm, emotional and real, and will hook you into the developments that occur throughout the film. The supporting cast of youngsters Aryana Engineer as Max and Jimmy Bennett as Daniel are also incredibly convincing and make their presence known throughout, proving that they have the ability to be much more than cute supporting actors in the future. 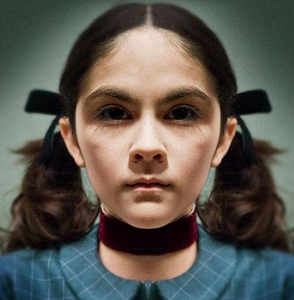 While the performances of Sarsgaard, Farmiga, Engineer and Bennett are excellent, the movie is made by the skill and sheer evilness of Isabelle Fuhrman as Esther. Cunning, witty and demonic, Fuhrman has you in the palm of her hand throughout the entire 123 minutes of the film. A combination of Dexter Morgan from the Showtime hit “Dexter” and John Torrance from “The Shining,” her character is pure hate, masked in manipulation and tact. Getting an 11-year-old to be able to pull something off a character so intense is no simple task either. Just like her young co-stars, she has a bright future in Hollywood. Of the three however, she may have the brightest. The cinematography and pacing of “Orphan” is also something to behold. It manages to make a scene as serene and fun as a playground and turn it into a maze of death and destruction. Throughout the film, you’ll wonder when the next big shock is coming and you’ll be surprised every time- no predictability there at all. Because of this winning combination of titillating writing and stellar acting, “Orphan” is a surefire success. Sometimes, excellent horror challenges the mind as much as it does scare the soul and is as bloody as it is intelligent. “Orphan,” simply put, has it all.